It is possible to walk to most of the points of interest of Lisbon. There is a convenient metro system which helps you get to locations such as the airport or train station. I stayed at the 1908 Lisboa Hotel which is perfectly located in Intendente. The Sao Jorge is a Moorish castle on a hilltop in Lisbon. The citadel dates back to the 2nd century. The Romans built the first fortifications. During the 10th century the fortifications were rebuilt by the Moorish tribes and today it remains a Medieval style castle. Entrance fee is about €8. I recommend visiting Sao Jorge early evening just before sunset. 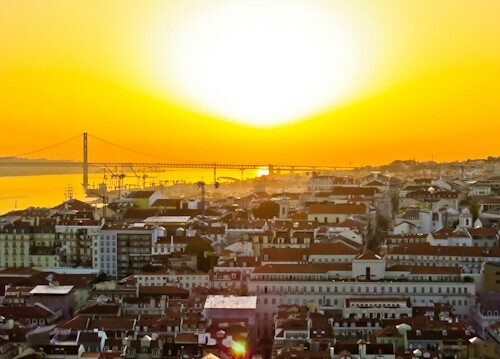 You’ll see a stunning sunset over Lisbon and it shouldn’t be too hot at this time of day either. There are many easily identifiable points of interest from the viewpoint. You can see the Commerce Square and all the colorful buildings surrounding it. When the sun has set the first point of interest to be lit up is the Santa Justa lift. If you stand directly facing it you can photograph it with the road leading up to it. Lisbon cathedral is known in Portuguese as Sé de Lisboa. It was built in the 12th century and has been modified throughout the years. Its architectural style is a mix of Roman, Gothic and Baroque. You’ll pass this as you walk up and down to Sao Jorge castle. The yellow trams pass by here too so it’s possible to photograph it as a tram passes. Belem Tower is known in Portuguese as Torre de Belem. It is a UNESCO world heritage site. The tower is located at the mouth of the Tagus river. 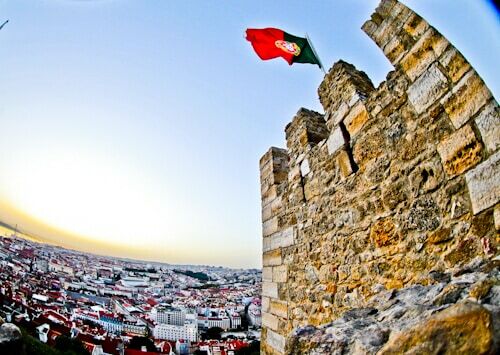 It was built at the start of the 16th century to defend Lisbon. 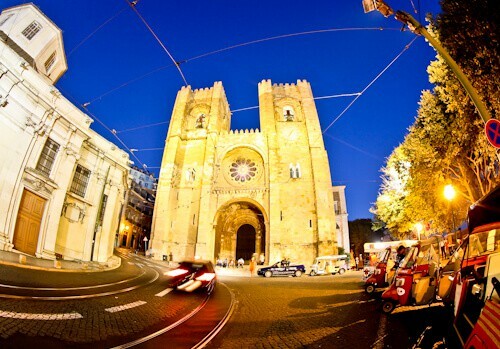 To reach Belem Tower you must take bus number E15 from the historic center of Lisbon. It leaves regularly and takes around 25 minutes. The reason I don’t have a picture is because I took the E15 bus during rush hour. I sat on the bus for around 15 minutes and didn’t go further than 4 blocks. I recommend visiting the Belem Tower when it’s not rush hour. 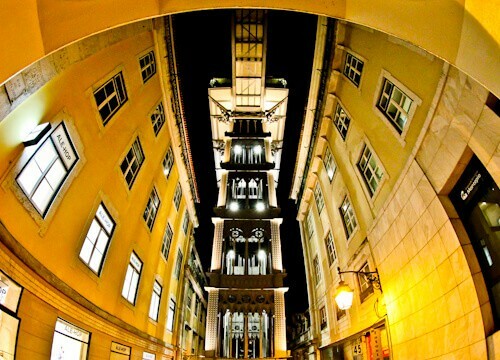 The Santa Justa lift is located in the historic center of Lisbon. Its purpose is to connect the lower city with Carmo Square. For this reason it’s sometimes referred to as Carmo lift. There is a viewing platform at the top offering wonderful views over the city. The designer of the lift was a Lisbon born student of Gustave Eiffel. He wanted his own masterpiece in his city. He managed to create his masterpiece whilst solving a problem at the same time. The problem being the steep walk to Carmo Square. Commerce Square is known in Portuguese as Praça do Comércio. It’s located next to the Tagus river. Portugal used to have a royal family. 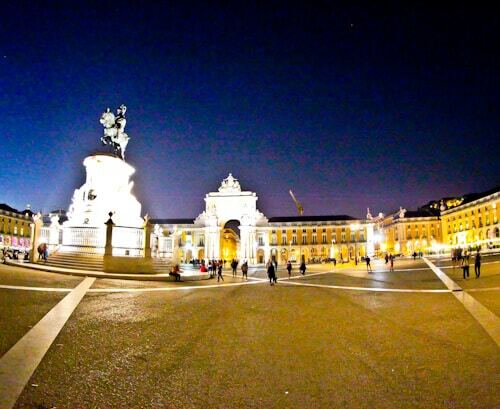 The second last king of Portugal, Carlos I was killed in this square. He was shot and killed whilst passing through in a royal carriage. He was killed by members of the Republican party. Two years later the Republican party would overthrow the Portuguese monarchy. The square is huge and incredibly difficult to photograph. I found the best place to photograph it from was the viewpoint on Sao Jorge castle. A picture of a traditional Portuguese yellow tram always works well on Instagram. They look especially good when they pass a traditional Portuguese tiled house. There are lots of tram photographing opportunities in Lisbon. Just look for a traditional house that a tram passes by and wait. The blue tiled houses (azulejos) photograph best with the yellow tram. The 1908 Lisboa hotel @1908_lisboahotel is conveniently located in Intendente, Lisbon. You can walk to the major points of interest of Lisbon from here. In 1908 the building won a prestigious Portuguese architectural award, hence the name, 1908 Lisboa Hotel. Check out @1908_lisboahotel for more pictures of the hotel and interior. The trams pass in front of the 1908 Lisboa hotel which is a unique structure in Lisbon. It won a prestigious architectural award in 1908 which is where the hotel got its name from. A picture of a traditional yellow tram passing in front of this hotel is proven to do well on Instagram. It’s best to take this shot early morning when there isn’t much traffic. Lisbon is home to one of the best football stadiums in the world. The home of Benfica is the Estadio da Luz. On a stadium tour you’ll see the modern stadium from various different angles. You’ll meet the Benfica eagles which fly around the stadium before games. They have the best football museum you’ll ever visit. The museum ties the history of the club with that of Lisbon. You are guaranteed a good experience, alone or with your family. You can easily reach the stadium by the Lisbon metro. 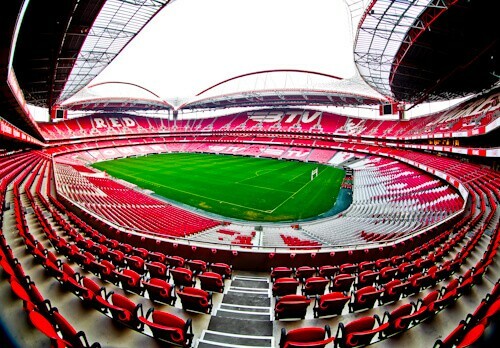 Read my in depth stadium tour experience at the Estadio da Luz. The Sporting Lisbon stadium is known in Portuguese as Estadio Jose Alvalade. As a neutral I would recommend visiting Benfica stadium as it’s a better experience. 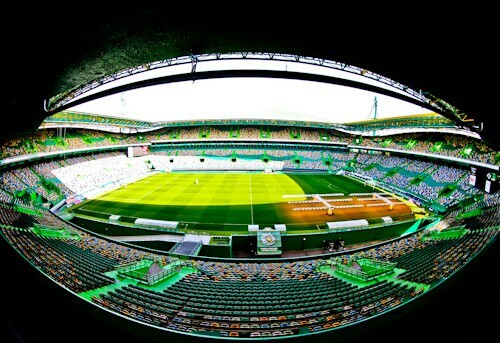 But if you are a Sporting Lisbon or Cristiano Ronaldo fan then I’d recommend Estadio Jose Alvalade. Before Cristiano Ronaldo was famous he played for Sporting Lisbon. He played here from 1997-2002. He is considered a Sporting Lisbon legend and you’ll see many images of him in the stadium and club shop. After touring the stadium you may visit the museum. In the museum you can read about the history of Sporting Lisbon and see their trophies. You can easily reach the stadium by the Lisbon metro. Read my in depth stadium tour experience at the Estadio Jose Alvalade. Sintra and its surroundings are a UNESCO world heritage site. The picture perfect Pena Palace is located there (above). One side of this palace is yellow and the other red. There is also a wall covered in the traditional Portuguese azulejos. You are guaranteed Instagram worthy images when you visit. Other notable points of interest in Sintra are the Castle of the Moors, Sintra Palace and Quinta da Regaleira. The town of Sintra has lots of traditional Portuguese tiled streets and colorful buildings. A short bus ride west of Sintra is Cabo da Roca. This is the westernmost point of continental Europe. Sintra is a short train ride from Lisbon. Trains leave from Lisbon Rossio station every 30 minutes. Read about my experience in Sintra. 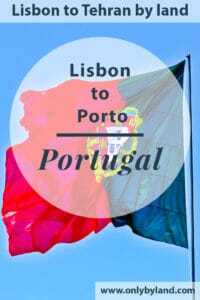 There are several trains from Lisbon to Porto everyday. The journey time is less than 3 hours and the train is very modern. As always with trains if you book in advance you’ll get a lower fare. 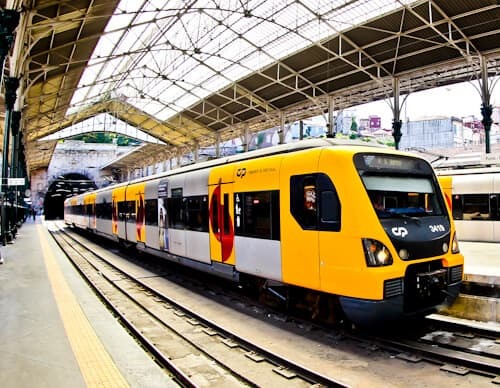 The fare between Lisbon and Porto is around €25-€40 one way. 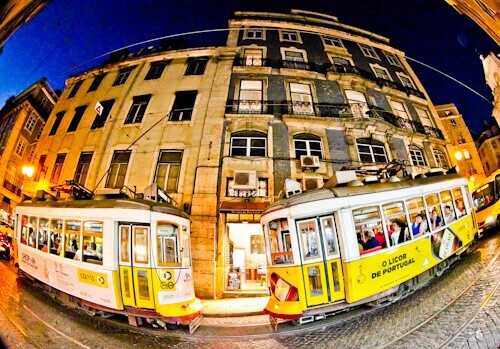 Lisbon is such a colorful city, which is why I want to so desperately go there! The stadium hasn’t been included in any travel guides that I’ve seen, but I don’t think I’d go there unless I was going to watch a sporting event. 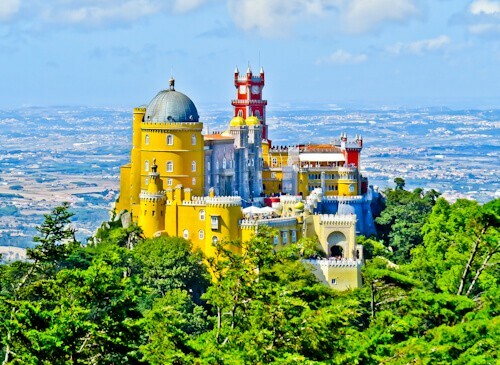 The Sintra castle is definitely on my bucket list though. Portugal never even figured on my travel radar but your post certainly makes it more attractive! I’m intrigued by its Moorish history. I would love to visit Sintra and snap those trams all day. Lovely write up! You’re so right about photo opportunities in Lisbon, they’re everywhere. I have such fond memories of the city, but love Belem Tower and seeing Sintra on a day trip. The next time I return I’ll try visiting Benfica Stadium; I enjoyed your last post on it! I visited Lisbon when I was a student in Spain. It’s a beautiful city and I’d love to go back someday. When I visited I didn’t go to any of the places you mentioned so it would be nice to go and soak up some of what the city is known for. Portugal has been on my list for AGES! One of those countries that the time has just never been right for. Great ideas on here–I’d especially love to go photograph Sintra, it looks so colorful and photogenic! By the looks of it, Lisbon is a beautiful city and my kind of city to explore. I love that you can explore these sights on foot. I love a walkable city because you tend to see more as you walk from one point to another. The view from the Sao Jose Castle (especially that sunset) is beautiful beyond words – looks like to best spot to enjoy the city skyline. Lisbon really comes across as a vibrant city and well someday I hope I make it to Porto especially for the wine. I’ve already read about the Lisboa Hotel which is a beautiful property, and the two stadiums I am sure are must visits for any football fan. Also Sintra looks really nice and I always like visiting UNESCO sites.